No. 9 & 11, Jalan PU 5/1, Taman Puchong Utama, 47140 Puchong, Selangor, Malaysia. 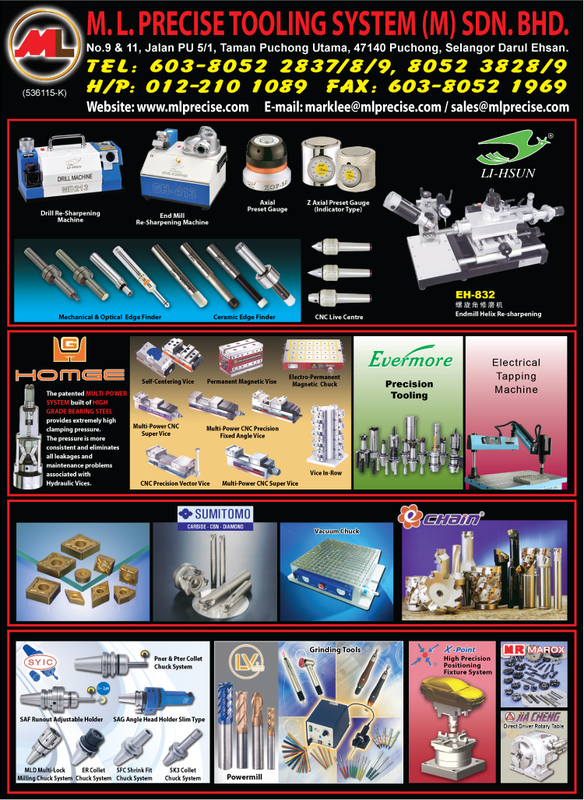 ML PRECISE TOOLING SYSTEM (M) SDN BHD was founded in 1996,we specialize in supplying C.N.C machine accessories , tool holders,carbide insert and cutting tools, suitable for all kind of CNC Machine Centre, CNC Lathe Machine , Grinding Machine and etc to customers . Over the years we have been introducting the best and excellent products from Taiwan. We also import products from Japan and Europe to suit our Malaysia economic market. We deeply realize the only way to obtain customers’ dependability is to offer execellent quality of product and competitive price. We also provide you with the most comprehensive after sales service and guarantee. And this is the goal of what we do at ML Precise Tooling System (M) Sdn Bhd. “We always adhere to the operational principle of “Looking for high QUALITY, UTILITY, INNOVATION AND REFINEMENT” to provide our customer with the best product service. Finally, we should thank all the customers to choose the products that we offer.